1.30.9.2: Red Electric Moon, Kin 29. The following is offered as a guideline of how to work with the (Galactic Mayan) Interdimensional Star Map to further unlock your cosmic memory. This map was created by Jose Arguelles/Valum Votan and first appeared in his 1987 work Surfers of the Zuvuya. 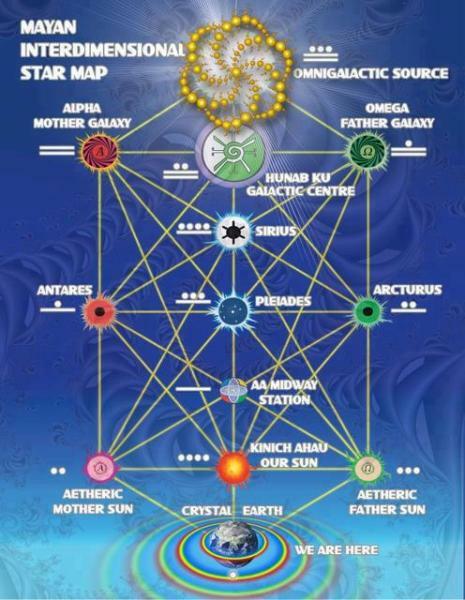 The key is to meditate this system into your chakras to embody the star knowledge. Note that this particular map begins at the third eye with the Hunab Ku: One Giver of Movement and Measure.